Rivers State Governor Nyesom Wike has released a statement denying claims that he was a sponsor of Niger Delta Avengers. A faction of the militant group, Niger Delta Avengers had released a statement over the weekend that himself and some politicians including former President Goodluck Jonathan and some others were sponsors of their activities. 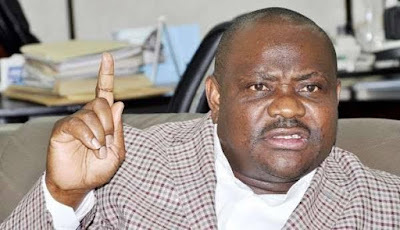 �Our attention has been drawn to yet another false media propaganda wherein it was claimed that Rivers State Governor, Nyesom Ezenwo Wike is one of the sponsors of the militant group, the Niger Delta Avengers. We nequivocally deny this false report which was fabricated with the aim of diverting attention from the superlative performance of Governor Wike. Any close observer of this propaganda machine would have noticed that all they do is concoct lies about Rivers State. We urge all well-meaning persons to disregard this current falsehood credited to a faceless splinter group of NDA.